1. Boil the dal with turmeric powder and half a litre water till cooked. 2. Strain the dal, reserve the water for later use. Mash the dal lightly. 3. Soak tamarind in warm water, extract pulp and keep aside. 4. Bring one cup water to a boil. Add chopped tomatoes, tamarind pulp, asafoetida, chopped coriander leaves, curry leaves and rasam powder. 5. Cook over low heat for 10-15 minutes. Add the reserved dal water and simmer. Sprinkle crushed peppercorns. 6. Heat ghee. Temper with mustard seeds and red chillies. Pour over the rasam. 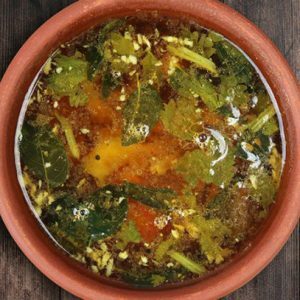 Feel free to comment or share your thoughts on this Tomato Chilli Rasam Recipe from Awesome Cuisine.